Japan has an extensive and efficient train network; however, without an intimate knowledge of the system, its complexity can make it difficult to figure out an efficient route. On top of that, while most railway, bus and ferry companies publish their timetables online, few offer good English language resources. Luckily there are several excellent English online route finders available on the internet to help travelers navigate the railway system in Japan. Thanks to its English interface and flexible search options, Hyperdia is the best route finder website available to travelers. It is also the only website with the option to exclude Nozomi and Mizuho trains from the results, making it an excellent tool for Japan Rail Pass holders to determine routes that are valid with their passes. 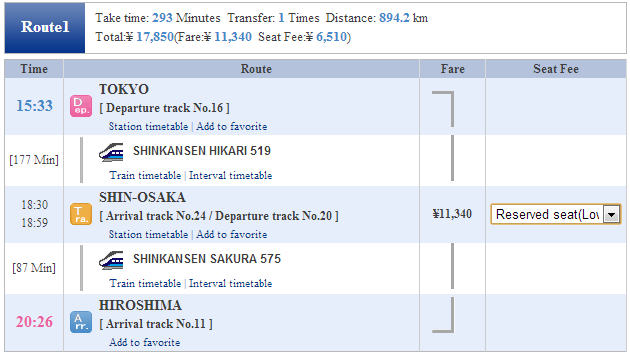 Likewise, the option to limit results to only local JR trains makes it a good tool for Seishun 18 Kippu users. Hyperdia’s basic search functions allow you to quickly look up routes between two stations. Just start inputting a station name, and Hyperdia will attempt to autocomplete it. One of Hyperdia’s weaknesses is its inability to recognize alternate station name spellings. For example, Hyperdia will only recogize “Shin-Osaka” with a dash, but won’t understand “Shin Osaka” with a space or “Shinosaka” written together. Another minor challenge for the user is to know the actual station names. Fukuoka’s main railway station, for example, is called “Hakata”. Entering “Fukuoka” will get you to a small station in the countryside of Toyama Prefecture. Likewise, “Shimoda” will get you close to the northern tip of Honshu rather than to the more famous city near the southern tip of the Izu Peninsula whose railway station is named “Izukyu Shimoda”. Date = Select a travel date. If your travel date is more than 2-3 months in the future, we recommend that you input a similar date (e.g. weekday, non-holiday) in the near future instead, because timetable data is only published a few months in advance, and Hyperdia sometimes returns strange data for dates in the far future. Time = Select a time. Tip: To search the first connection of the day, select a departure time around 3am. Conversely, to search the last connection of the day, select an arrival time around 3am. Clicking the SearchDetails button will open the advanced search options where you can further refine your search. This is especially useful to exclude airplanes or certain train types from the results, e.g. for Japan Rail Pass holders to find routes that exclude Nozomi trains. Pass1 – Pass3 = Enter the name(s) of stations that you want to pass along the way. Order = Select how to order the results. Route Outputs = Select the number of results to display. Airplane = Check to include flights in the results. Airport Shuttle Bus = Check to include airport buses. Bullet Train = Check to include shinkansen (except Nozomi, Mizuho and Hayabusa trains). NOZOMI/MIZUHO/HAYABUSA = Check to include these shinkansen trains in the results. This is a useful option for filtering out Nozomi and Mizuho trains which are not covered by the Japan Rail Pass. Note, however, that unlike Nozomi and Mizuho trains, Hayabusa trains are covered by the Japan Rail Pass. Limited Express = Check to include limited express trains that require a limited express surcharge. Limited express trains that do not require a surcharge (e.g. Keisei and Hankyu limited express trains) will not be affected by this option. Express = Check to include JR express trains in the results. Express trains by other railway companies will not be affected by this option. Liner = Check to include liner trains, i.e. trains that require a special liner ticket. Walk = Check to include walking (between nearby stations). Sleeper Limited Express/Express = Check to include night trains that are classified as limited express or express trains. Ordinary Train = Check to include trains that do not require a surcharge, especially local and rapid trains. Japan Railway (JR) = Check to include Japan Railway trains. Private Railway = Check to include private railways, i.e. non-JR trains. This is useful for filtering out results that are not covered by the Japan Rail Pass or Seishun 18 Kippu. Total = Total cost of the trip including any supplementary fees. This is the price that you pay. It is determined by adding up the Fare and Seat Fee (described below). Fare = The basic fare which is calculated based on distance traveled. Usually known as the base fare. Seat Fee = Confusingly labeled by Hyperdia, this entry lists the total cost of all supplementary fees for the specified route including limited express fees, green car fees, berth fees and seat reservation fees. [Departure track No.16] = Track number that the train departs from (only shown if available). = Arrival time of first train, departure time of next train. You can assume that the time between the two is sufficient to make the transfer at an average pace. = Backtrack Symbol: A transfer is necessary to a train that departs the station in the same direction which the incoming train arrived from. = Through Symbol: No transfer is necessary. Passengers can remain onboard the train. Hyperdia shows through-stations for technical reasons that are often irrelevant to travelers. [Arrival track No.24/Departure track No.20] = Track number that the trains arrive/depart from (only shown if available). [Arrival track No.11] = Track number that the train arrives on (only shown if available). Fare = The base fare for each section of the journey. In case of flights, only the regular fares (as opposed to discount fares) are shown. 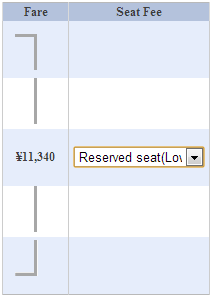 Seat Fee = Supplement fee to be paid for shinkansen and some limited express, express and night trains. Dropdown boxes let you select seat options if available, such as unreserved seats, reserved seats, green car seats or night train berths (actual berth types available on night trains are not always accurately displayed). One of Hyperdia’s major strenths is that it allows Japan Rail Pass holders to limit their searches to trains that are covered by their pass. To do so, you need to uncheck the following from the Advanced Search Options: Airplane, NOZOMI/MIZUHO/HAYABUSA, Liner, Sleeper Trains and Private Railway. Two warnings: 1) the above settings will indeed remove the Nozomi and Mizuho trains which are not covered by the Japan Rail Pass, but they also remove Hayabusa trains, which are covered by the Japan Rail Pass; 2) the results may include a small number of JR trains that partially use non-JR tracks on which pass holders have to pay a supplement fee. Hyperdia is also a powerful tool for Seishun 18 Kippu users. 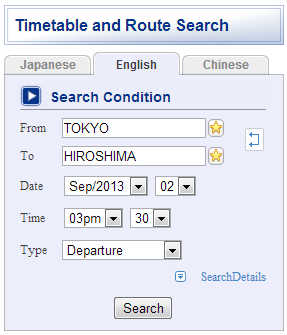 To look up connections, check the Advance Search Options boxes for only Japan Railway(JR), Ordinary Train and Walk. Note that results may include JR trains that partially use non-JR tracks and are not covered by the Seishun 18 Kippu. Printed railway timetables in Japanese are sold in bookstores and kiosks across Japan. Both nationwide timetables as well as those covering a specific region or railway company are available. The largest timetable books contain kana readings for all station names, but they can still be rather difficult to use without Japanese reading skills. Unfortunately, comprehensive printed English timetables are not widely available, however some rail companies print booklets and pamphlets of timetables for selected routes. Among the most complete nationwide timetables are the JR and JTB timetable books, which are published monthy in full and pocket versions. Besides the full schedules of all train lines operated by Japan Railways (JR), they contain the basic schedules of trains by other railway, bus, ferry and airlinecompanies as well as a wide array of practical information covering topics such as discount tickets, fares and regulations.